I saw a video on Instagram Sunday morning that caught my attention. Today I realized it was one part of a string of stories from the last month that continue to inspire me. These are women runners, doing extraordinary things. There was the podcast episode from Another Mother Runner where Dimity and Sarah are talking to the oldest finisher of the Boston Marathon, Katherine Beiers, who is 82. I dare you to listen to it and not be moved. There was also this article about her from Runner’s World. Then I saw the news about the 92 year-old who became the oldest woman marathon finisher at the San Diego Rock ‘n Roll Marathon in June. I am amazed by what she has accomplished. 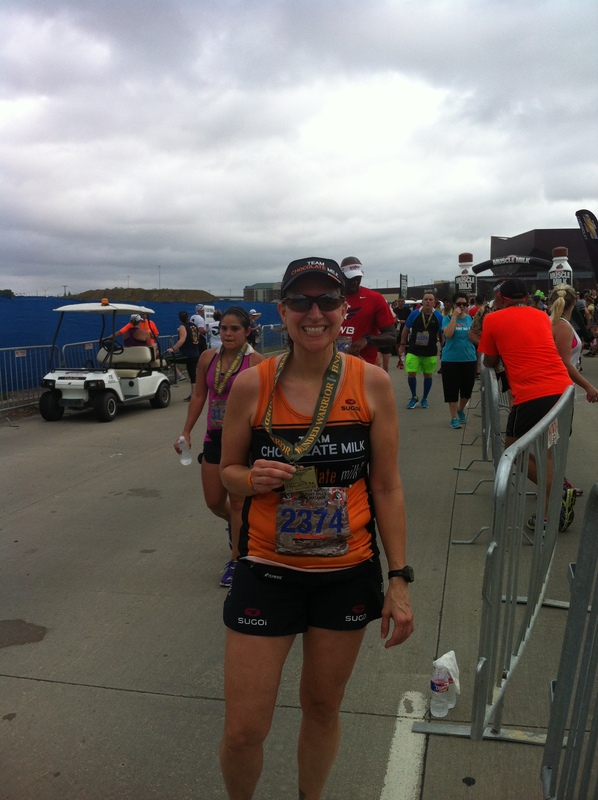 She is a cancer survivor, a member of Team in Training, and has run that race 16 times! The most recent news was an Instagram video on the last finisher for the Western States 100. Ultra running intrigues me, but not in a “I want to try that” way. I had been following some of the coverage through social media. The cut off time for this 100 miler is 30 hours. The last finisher came in with six seconds to spare. That just blows my mind to cover that kind of mileage and time on your feet, but even more amazing to me was this woman’s age: 70. Wow. Since treating and recovering from my plantar fasciitis injury, I have gained a new appreciation for just being out there. Speed is not as important as a pain-free run. I’m grateful to be able to do this. I’m more aware of not taking it for granted, and enjoying the everyday runs as much as the finish lines. I want to continue running for as long as I am able. No matter the distance. In an age when our nation is increasingly sedentary and overweight, there are women out there doing some awesome feats of strength and endurance. Age is just a number – don’t let it define you. Just get up and go. Running really can be for a lifetime. I had no idea what to expect when I was thinking about my upcoming race last week. On Saturday, when we went to the expo I noticed that I was a little nervous. Nervous about my foot flaring up (and starting the healing process all over again). Nervous about the distance (because of my limited double digit long runs). Nervous about going out too fast and falling apart (like I did last time). I shared some of my fears about race day with my husband, and he reminded me of why I was running. I ran into two other members of Team Chocolate Milk on race morning. It was nice to chat and take my mind off of my nerves. We talked about how the course had been changed due to flooding to an out and back loop – one loop for the 10k, and two for the half. Some people don’t like that type of course, but I think it can be fun – especially if you know others in the race. So many races in the metroplex have been rescheduled or cancelled due to the heavy rain, so I’m thankful there was an alternate plan. One of my favorite things about this race is the military presence. From the beginning with the flags and National Anthem, all thoughts of myself were pushed aside. Every time I hear the Star Spangled Banner at the start of a race, I think of how wonderful it is to be able to do this. This freedom that we take for granted. So many have sacrificed. I’m grateful to have the opportunity to give back in this way. I started the race, and held back from the beginning. 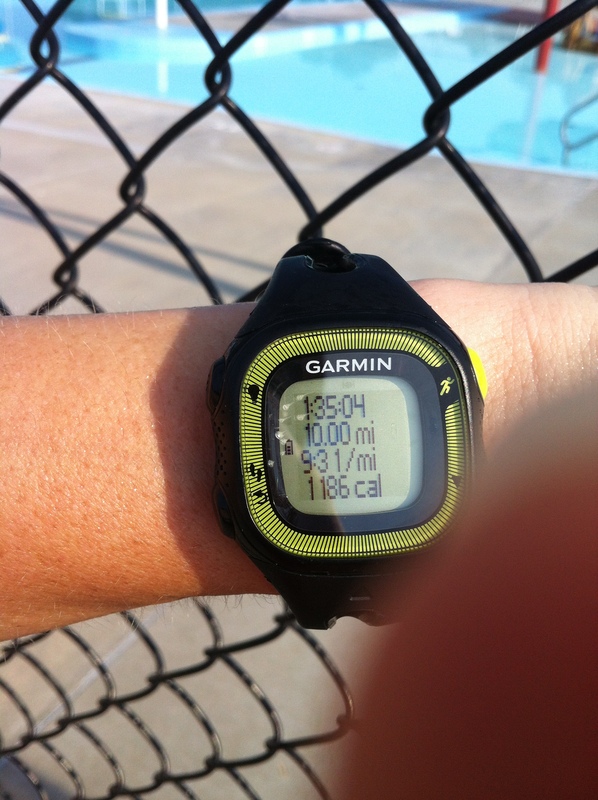 I was sweating through the first few miles, and I wondered how the heat would affect me. I was ready and armed with my handheld of Nuun and two Nuun Plus tablets. As the course wound around mile 3.5 I noticed a good-sized uphill. That would be coming up on mile 10 in the second loop. “That might hurt,” I thought. When I stopped at the aid station near the halfway point to refill my bottle, it was the first time I stopped. After refilling my bottle, I dropped one of the Nuun plus tablets on the ground. Shoot! I briefly looked for it, for the thought of road gunk wasn’t appealing so I kept running. On my way back after the turnaround I saw my lonely tablet laying on the ground. Looking back, this was the only hiccup I had through the race. Somewhere between mile 8-9, a runner came up beside me and asked me about the name on the back of my shirt. This gave me a chance to explain about Medals of Honor, my background as a Navy wife. She is married to a Marine. We continued to chat about bases, stations, and other military stuff as we ran. At the mile 10 hill, I decided to power up and keep my pace as steady as possible. Until my plantar fasciitis, hills have always been my strength and I could feel it returning. Through the last 5k of the race, I became the chatty runner. I was thanking police officers, volunteers, veterans, and cheering on 10k walkers as I passed. I saw another runner from our local group and yelled out across the course at him and waved. I was truly grateful to be out there. I found my joy again. My official time was 2:04:25 and it was a good day. When I finished, I felt tired – but strong. 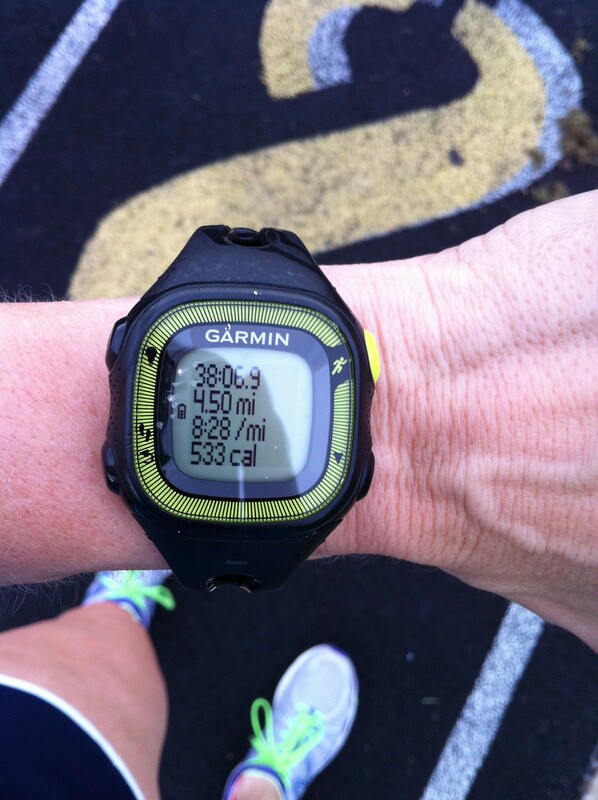 My foot was throbbing, but it didn’t affect my pace at all. Overall, I’m pleased with my effort. After a bit of icing throughout the day, my foot was good to go. But most importantly, because of Medals of Honor, this service member’s family will be receiving the medal I earned from the race. 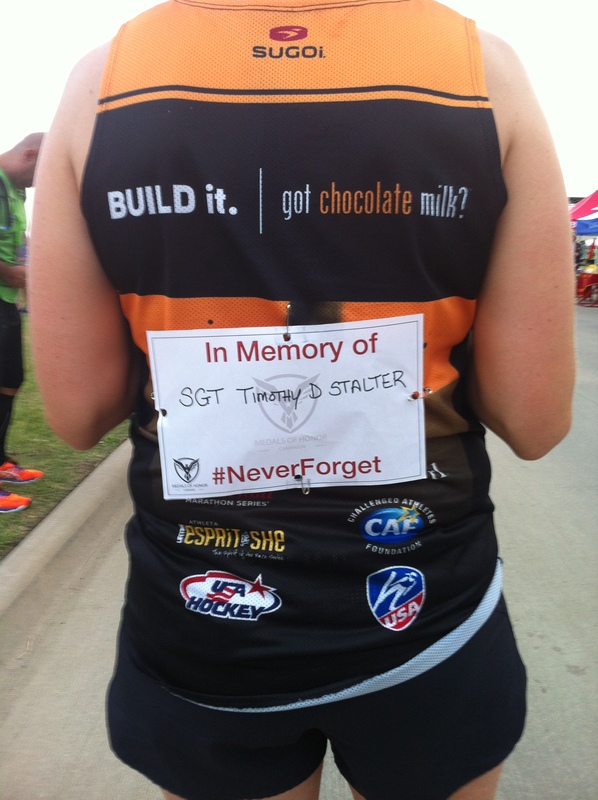 My hope is that this race, completed in remembrance of SGT Timothy D. Statler, will offer some comfort to the family. That is why I ran. After dealing with setbacks on my speed and mileage due to my plantar fasciitis injury, I finally feel ready for my half marathon this Sunday. My foot was a little inflamed after 12 miles in the rain, dodging puddles, but is better this week. I kept most of my weekly runs short last week, with one 6 miler and the rest under 4. On Wednesday, for National Running Day, we had a group social run. That was fun because I got to run with some new faces. On Saturday it was warm and humid. Even starting at 7 am is starting to feel too late. 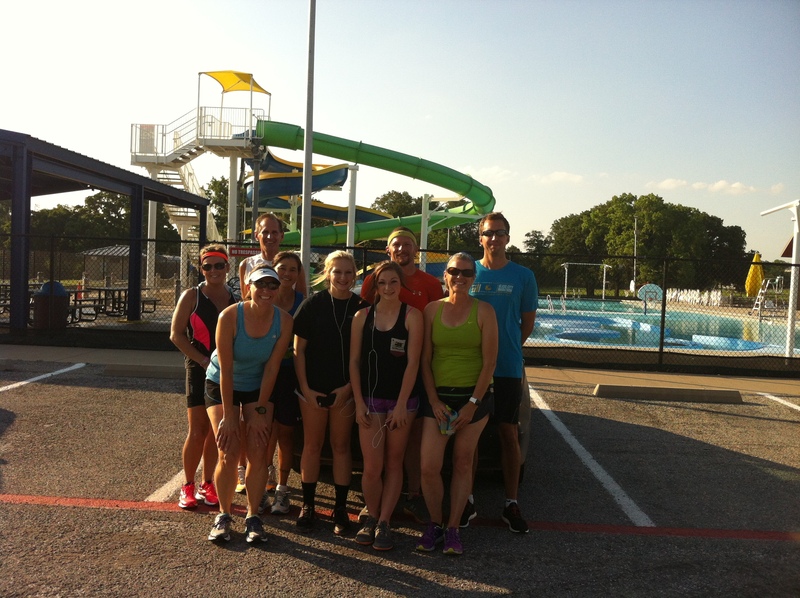 Our group starts and finishes at a park with a pool, and it’s too bad it’s not open that early because it is certainly inviting after a sweaty long run. My 10 miler gave me enough feedback to know I’m probably not in sub-2:00 range yet, with the heat. This morning I ran a 6 mile progression run. My fastest mile is just over what I was running half marathons at last fall. But I am continually reminding myself of what’s important. I am running for more than a medal. 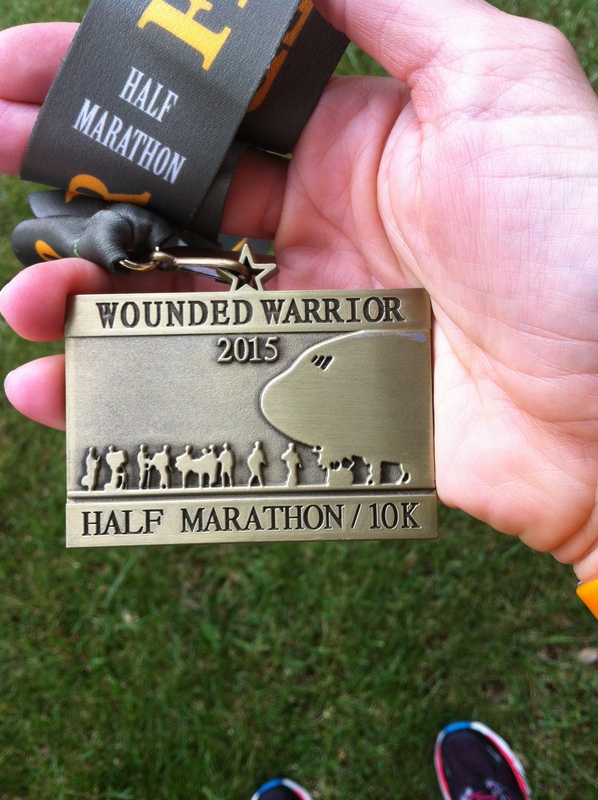 I am running the Wounded Warrior Half Marathon in Irving which benefits Wounded Warrior Project. I am also running for Medals of Honor and will be donating my medal to the family of a fallen military serviceman. As the wife of a Navy veteran, I want to do whatever I can to help our military, families, and others who have served. That’s what is keeping me from getting frustrated with my progress. So on Sunday, I will do my best, but ultimately I am not running for myself. Can I just tell you how glad I am to be in a new month? May was rough. Murphy’s Law hit us big time. It actually started late April with the dryer and washer breakdowns, then on Mother’s Day with the flooding under the house. 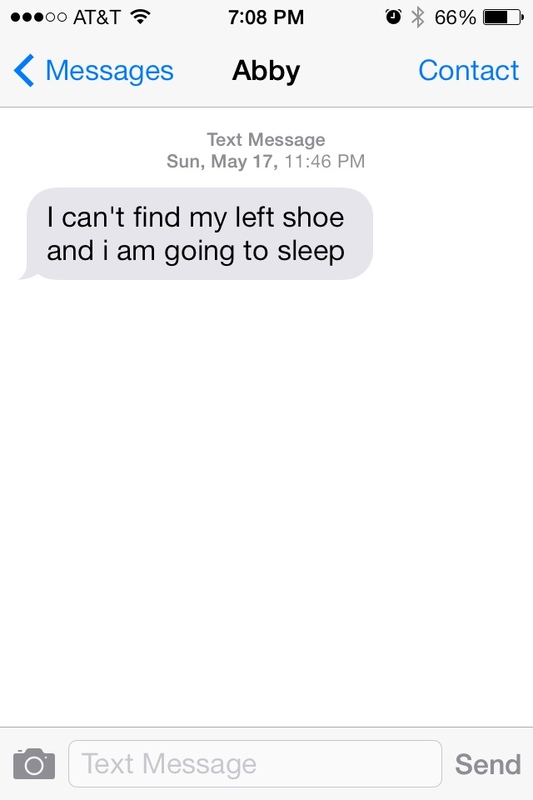 The day after prom, when I was totally sleep deprived, I got this gem of a text from my 12 year-old (who is one tough wake-up on school mornings). Note the time of this text. We had more flooding exactly two weeks after the first time. Apparently we are okay unless it rains hard all night long on an already saturated ground. But it sure does bring a family together when you’re working together to bail out water. The concern was to get it down enough so our entire first floor didn’t flood. I started back on my Racing Weight guidelines to try to shed the 10 pounds that doesn’t seem to want to move. I set out for my 10k time trial – to get a base time – on Wednesday. I found out that I can’t run as fast as I thought I should be able to. I ended up calling it done at 4.5 miles. My legs were Jell-O. After my mile cool down, I got attacked by mosquitos on my walk back to the car. I was frustrated and disappointed in my pacing. Then I had to remind myself: patience, progress. I cannot pick back up where I left off almost 7-8 months ago (peak marathon training). I am still healing with the injury. I am trying to lose weight by eating higher protein and less carbs. Those three things will affect my speed, and I need to focus on what’s most important right now, and that’s to get my foot completely healed and drop the weight. The speed will come later. And that’s okay. Oh, and I have lost 3 1/2 pounds since March. Yay! So this is my base. On Friday we had another heavy rain that lasted all night. I don’t know how much rain we got, but it poured for hours. I couldn’t sleep for fear of flooding again. I woke up every hour to check under the house and it seemed we were okay. Until 5 am when I planned to get on the treadmill. I learned how awesome my kids are, as they got up without complaint and helped me out. My husband was driving through that mess of a storm that stretched over 500 miles. He was worried about me. I was worried about him. 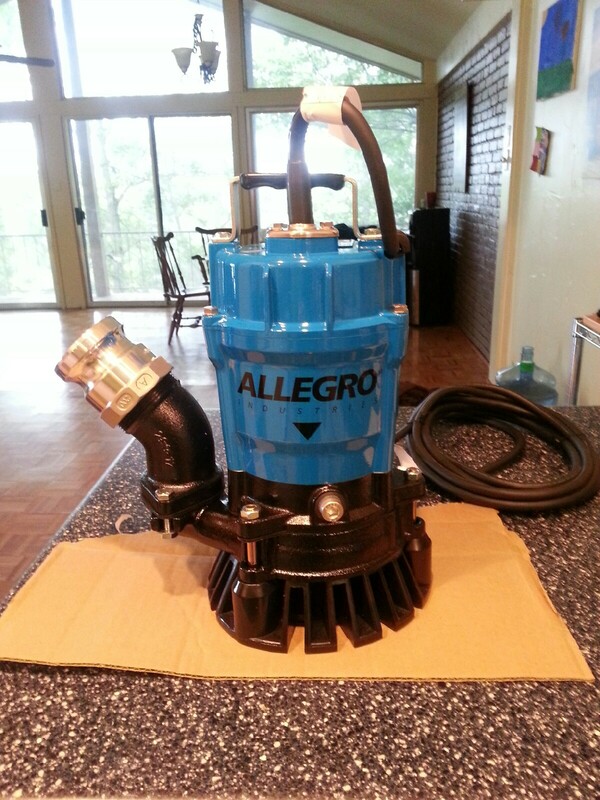 Thankfully, our heavy-duty sludge pump we ordered after the second incident came in that afternoon. How many pair of running shoes could I get for the cost of this pump? We were able to pump the rest of the water out in less than 5 minutes, and now the rain is out of the forecast for the next week. Of course. Saturday long run was in the rain, but thankfully the lightning stayed at bay so we could get the miles in. 12 done to prepare for the Wounded Warrior half and I felt pretty tough splashing through puddles like a little kid. It did bring along some major Sunday soreness though. But I feel better going into this race with a couple of double-digit runs. At least I feel I’m getting stronger, since I’ve been on the real-life cross-training/strength routine of dumping buckets of water, mowing and weed eating, dumping more buckets, and even more buckets of water. Whew!